This guide is to help people with crafting of Warframes and all blueprints. Where do you find the blueprints to Warframes? Where do you find a “Chassis”? Can I Wear a “Chassis”? WHERE THE HELL IS THE BUILDY THING THAT DOES THAT THING THAT I WANT!? I have read over some of the discussions and pleas for help. Well let us start at the start. 4 of these are screen tabs. The one named “Foundry” is the Crafting tab. 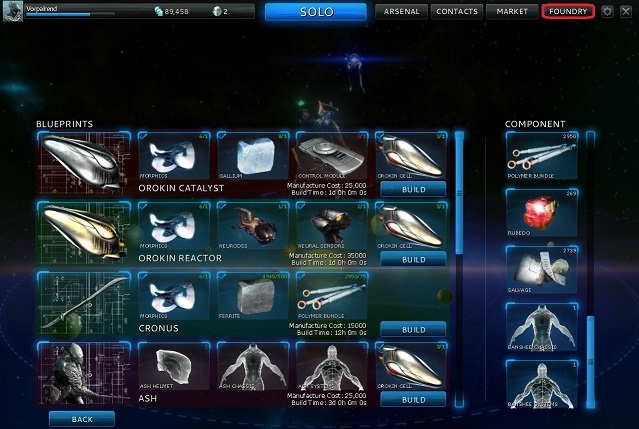 This is a screenshot of what the Foundry looks like. Obviously its not a raw start but it gives a pretty good idea of how this all starts. In the image there are 4 blueprints. 2 are able to be started while the other 2 are missing components. Green means it’s ready to build and get going. Red means you are missing some components. In the image the first blueprint “Orokin Catalyst” has 3/4 pieces ready for the creation to start. The red image beside it lets us know that is what we are missing. In this case its a component called a “Control Module”. So that’s the blueprints list. Next to this list is another called the “Component” list. This shows us exactly what we have already, whether it’s used in blueprints we have or not. So in this i have Polymer Bundles, Rubedo, Salvage and the Banshee Systems and Banshee Chassis. To start building you simply press the Build button on the green lit and ready to go blueprints. Before you ask “WHY ISNT IT WORKING”. !! !THERE IS A BUILD TIME!!! For instance, the Cronus sword takes 12 hours. The Orokin devices take 1 day. All Warframe components take 12 hours. And all Warframe builds take 3 days. I am well aware that the build time is a pain in the ♥♥♥ but the good news is you can build more than one thing at a time. This part of the crafting guide I will give you a link to another guide that has been helping me very much. All blueprints need something to be able to be built, pretty simple, but what are these things? Lets use the blueprint you are most likely to find first. This is the Cronus sword. Reason you are most likely to find this first is because it has a pretty high drop rate off the boss you’re going up against first. Captain Vor in Tolstoj on Mercury. There is also a manufacturing cost of 15,000 Credits. Never stress about credits, they come and they go but they are easy to come by, just play and you will get all the money you need in no time. But where do we get these components? Here is a link to the most useful guide on where to get components and how rare they are. Warframe components are a little different. 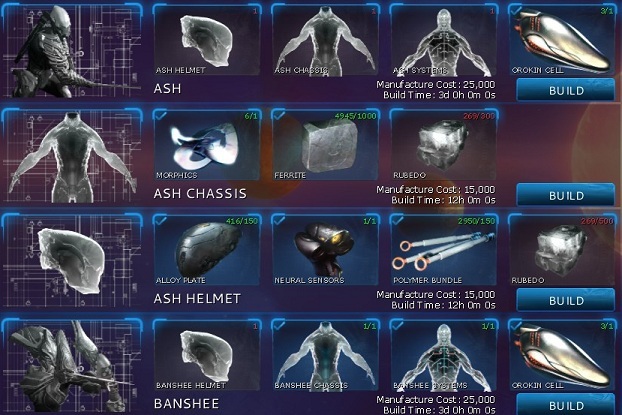 As you can see here I have the Ash and Banshee Blueprints along with the blueprints for the Ash Helmet and the Ash Chassis. Warframes require you to build their Chassis, Helmet and Systems before you can build the Warframe. All components for a Warframe will take 12 hours and the Warframe itself will take 3 days. Please note you cannot wear any of the pieces of the Warframe, you can only wear the Warframe itself. In the image you can see i have the Banshee and most of her components (yes her, she is a female frame) but the Ash frame says i have none of them. This is because Warframes only take their own chassis, systems and helmets. Each component of Warframes require 1 Rare component. Every frame needs a Warframe blueprint, Chassis, System and Helmet. All reports of Rare drops have been from Wikipedia. check out my guide on steam if you want to see the updated version. Just search for my name.